Viknesh Vijayenthiran June 7, 2013 Comment Now! 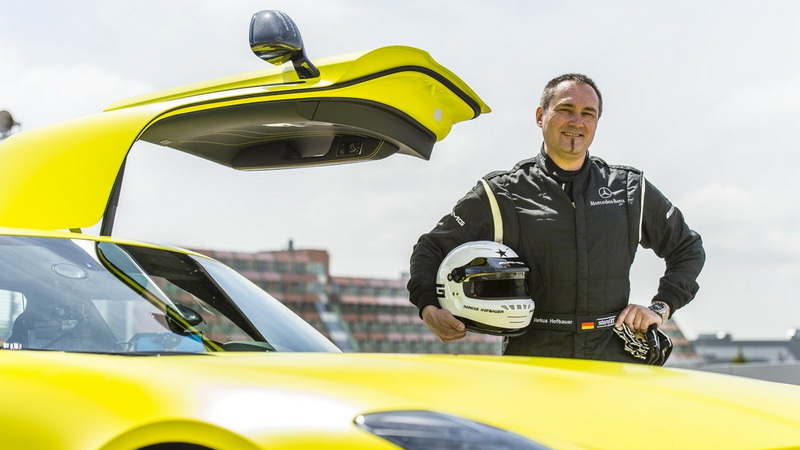 A Mercedes-Benz SLS AMG Electric Drive has just been driven around the full course of the Nürburgring Nordschleife in a time of 7:56.234, setting a new record for a production electric car at the legendary German circuit. The overall electric car record still stands at 7:22.329, set by Toyota’s TMG EV P002 race car last year. 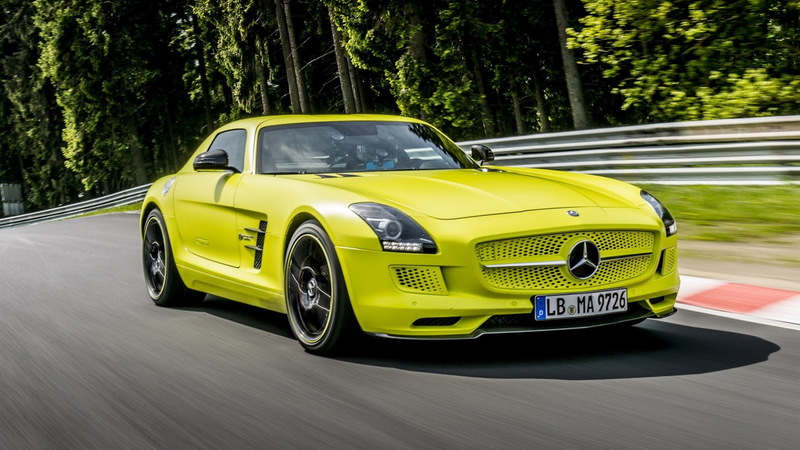 The SLS AMG Electric Drive is notably quicker than the previous production EV record holder, however, Audi’s canceled R8 e-tron, which in production trim managed a time of 8:09.099. 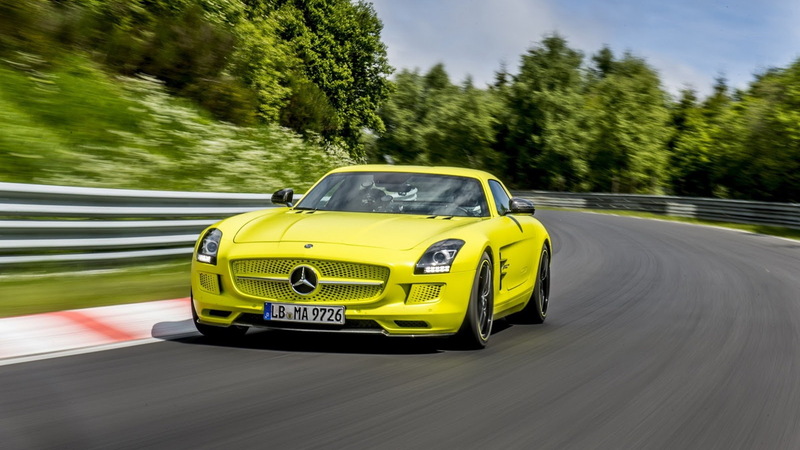 Unlike the Audi, you can actually buy an SLS AMG Electric Drive, though each will set you back a hefty sum of 416,500 euros (approximately $551,000) and none are planned for the U.S. market. 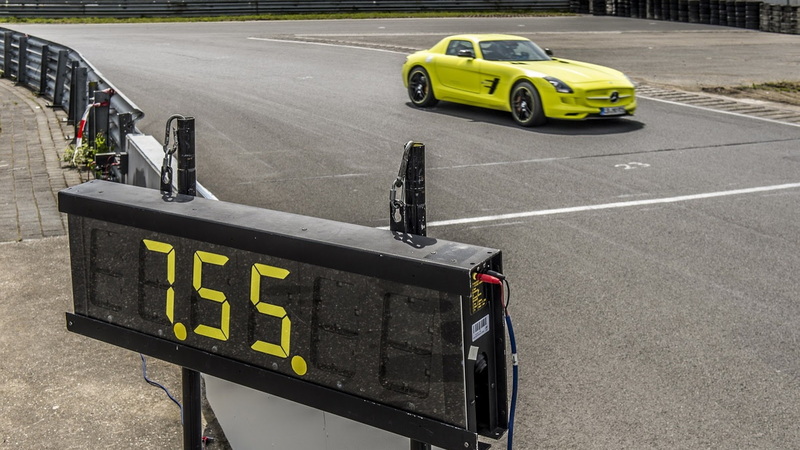 Nevertheless, it should come as no surprise that the SLS AMG Electric Drive is capable of putting down blistering lap times. The car is the most powerful ever launched by the AMG division; it comes with a staggering 522 kilowatts (740 horsepower) and 737 pound-feet of torque, which is enough for a 0-62 mph time of 3.9 seconds. Its top speed, meanwhile, is limited to 155 mph. In other words, the car is also the fastest and most powerful electric car ever produced. But in addition to its brute force, the SLS AMG Electric Drive also features a unique carbon fiber structure built around its battery system that helps improve overall stiffness and dynamics. Then there are the racing-style pushrod shocks and carbon ceramic brakes to harp on about, but the aspect that draws the most attention is the sophisticated torque vectoring system of the car developed using Formula One technology.Thanks to four independent electric motors, mounted to each wheel via an axially-arranged transmission design, the car’s central computer is able to control the torque sent to each wheel, in some cases sending negative amounts too, all via a new AMG Torque Dynamics system. This all adds up to giving the car agile response to movements of the accelerator pedal and steering wheel, despite its 4,774-pound heft. The 60-kilowatt-hour battery alone weighs 1,200 pounds and only offers a range of 150 miles with moderate driving. There are other downsides, too. Charge time takes more than 20 hours using an ordinary household outlet, though Mercedes-Benz plans to offer a quick-charge option. 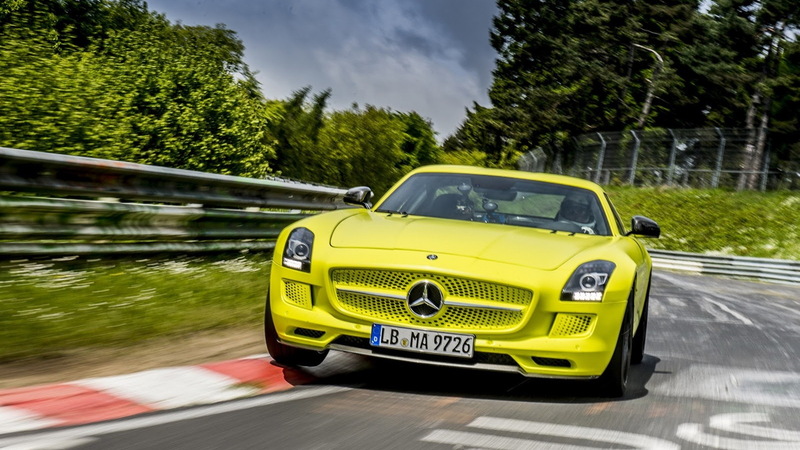 Deliveries of the Mercedes-Benz SLS AMG Electric Drive in Europe commence this month.